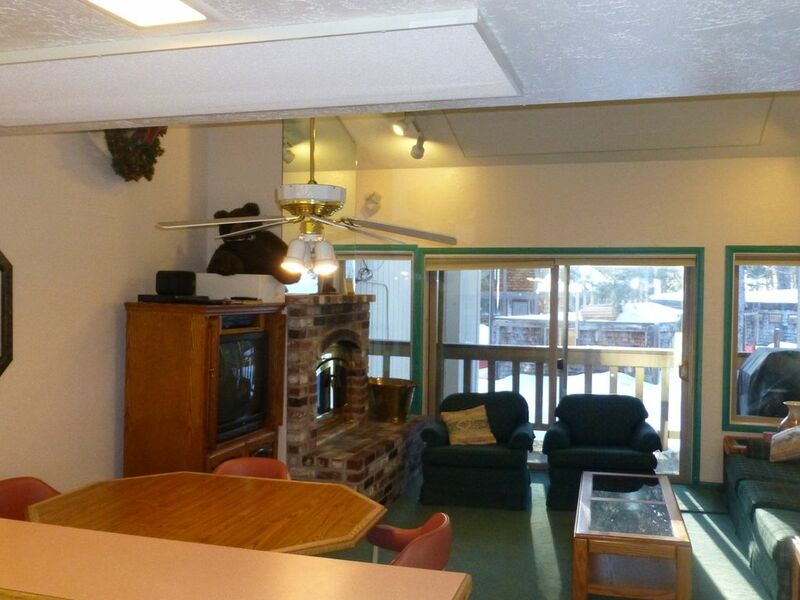 Our condo is located in Bear Valley Village away from the main cluster of buildings. The roads are always plowed and accessible. Our building has its own private parking lot. The condo is a tri-level. The master loft has a king-size bed, big closets, and excellent windows looking over a forested hill to the east. Great for sunrises and star-gazing. The main floor with the front entrance has a living / dining area with kitchen and a full bathroom. There is a brick insert wood fireplace, a big TV with stereo-surround, DishNetwork, DVD, CD, private balcony, and all appliances including Mr. Coffee, microwave, toaster, pots and pans etc. There is also a gas BBQ on the balcony. The ground level beneath the main floor has a large room with four single beds and a second TV with DVD as well as a private bedroom with another king-size bed. A second full bathroom is on this floor. On the main floor, the couch is also a queen-size hide-a-bed. There are also foam pads for another 2 or 3 people if you like. The condo sleeps 8 easily and 10 comfortably (two king + four singles + hide-a-bed). There is a ski locker for your gear. Everything except food & firewood is supplied including clean bedsheets, pillow cases, towels, soap, t.p., silverware, plates, etc. There is a washer and dryer. The ski resort is two miles up the highway. Nobody is closer. There are no condos or cabins at the resort itself. Dozens of miles of cross-country skiing can be accessed directly from our condo. There is fantastic sledding and hiking on The Rocks straight across from our front door. **** This decision may not be very 21st Century, but we actually prefer some human contact. Please call if you're interested or email Jeff directly at jeff at jverse dot com. Even if we're booked, we can put you on a cancellation list. Once in a while someone will back out of Christmas or President's Day. If you're at the top of the wait list, it's yours; but if you don't contact us, we'll never know you wanted it! We're happy to answer any questions. We've been skiing and playing at Bear Valley for three generations and have pretty much done it all. Our place offers superb hiking in all directions. Great boating and fishing at Lake Alpine, Spicer Reservoir and Stanislaus River plus swimming at Bear Lake. There are mountain bike trails for many, many miles. The week-long Music Festival is not to be missed! This beautifully furnished luxury condo features sunny, southern exposure into the master loft. This is a magical place to begin your day gazing at the magnificent pines or to enjoy the star-studded nights. A quick walk brings you to shops, restaurants, and the free shuttle to the ski resort. Right outside our front door are marvelous trees ascending gentle granite hills. The Rocks provide fantastic areas in which to play, sled, and walk up to finish your day with a bottle of wine and gorgeous views of the sunset. Bear Valley is a jewel on the western slopes of Alpine county. It's located off of Highway 4, a less-traveled and highly maintained road that never closes in winter, unlike the pass into Tahoe. Highway 4 doesn't experience the Tahoe traffic jams, either!!!!!! Spring, summer and fall offer hiking, biking, swimming and fishing with fewer crowds and more spectacular scenery than in most places in California. It's a 15 minute stroll from our condo to the beach at Bear Lake or a short drive to five other lakes or the Hell's Kitchen area on the Stanislaus River. Thousands of acres of forest surround the Village. Hi, I'm Patti Kelly. Believe it or not, I'm seventy years old with four grandkids -- and I still like to rip up the powder! Remember: 'Gravity is your friend.' Please join us here in Bear Valley for good fun, fast runs, and making great memories for your family!!! I love spending time with my family, skiing, sledding, and enjoying the beautiful Sierras. Our condo has free parking right in front of the building, and the lot and the roads are always plowed. *** NO SMOKING / NO PETS *** Cancellation policy: We do require notice 30 days ahead of your reservation to guarantee a full refund because in the meantime we've been turning other people away. Given less time, we still try to fill your spot -- and if we do, great. Often it's not a problem because demand is high. This was our first trip to Bear Valley and have never been in there we really were not sure what to expect. The grounds were a bit difficult to navigate when we arrived late Friday night because there was so much snow some signs were covered but, other than that the location was perfect. You can literally walk to the cross country ski area and the shuttle bus that goes to and from the ski resort was effortless! Yes, the condo is dated and there is no WiFi as others have noted in their review but, it has everything you need plus more! the beds are plenty and comfortable and warm. the kitchen is small an quaint but it was well stocked and the unit itself was very clean. The storage locker was a plus for all of our snow boards too. Patti is quick to respond to emails and gave us great tips for first timers. We will defiantly be going back next season. I read earlier reviews from January (2019) and agree that the condo could use an update, but the retro feel is also part of its charm. The two levels and the loft are ideal for families since you can stick the kids downstairs and enjoy a bit of downtime on the main floor. If you go up during winter and definitely be sure to take an ice scraper and shovel (we had the former not the latter). Also, our phones couldn't pick up the WiFi from the lodge (that is nearby). There is no private connection available. Our laptop did, however, pick up the lodge WiFi but was spotty and not very reliable. So glad you enjoyed your visit. Indeed there was crazy snow. That lower level is so very loved by kids. As I had mentioned to you, we did have a shovel available in the ski closet, and someone disappeared it. We do hope that you will come again. Liked the place overall. Priced a bit high considering the outdated condition and prices compared to other local rentals. Was surprised to find no WiFi in this day and age. Would consider staying again but only on weekends as I need WiFi for work during the week. Nice layout with upstairs loft bedroom, on the lowest level the family room was converted to a kids bedroom with TV the kids loved. DVD/VHS down there (the kids watched the original Parent Trap, one of the provided VHS tapes). Also down on this level is a small bedroom with a door. Thank you for your review. So very glad that you had a wonderful time. We love our condo too. Please do come again. Great place, esp. for families! So very glad that your family had a wonderful time at Bear Valley in our condo. We hope that you will choose to return.